Romanian intelligence services have already identified the first organization that organizes anti-NATO Summit acticities, daily Gardianul reports. Sources from the intelligence services told the Gardianul that dozens of persons suspected of intending to sabotage the event were thoroughly monitored. According to the daily, the respective sources, say that the core of an anarchist organization was identified at Iasi, where the anti-NATO militants met under the direct coordination of a non-governmental organization. The identified nucleus of the group is an association from Iasi called Centre for Art, Media and Social Action whose militants intend to go the next days to Bucharest. Last weekend a general rehearsal was carried out with the participation of over 12,000 police officers and gendarmes, applying all the restrictions that will go into effect on April 1. The general simulation was carried out without major incidents, but it lasted only half of the set time, because of the perturbation of the traffic in North Bucharest. The rehearsal was also attended by NATO security officials. All the actions were monitored from a unique command point, consisting of SPP, SRI, SIE, MIRA, MoD officers. The exercise concentrated all the types of activities to be run by the security forces stipulated for the four days of the Summit, reads a press release of the Media Group for Security News. From shutting down streets and boulevards and aligning snipers to catching stray dogs, the security level in Bucharest was highly improved for the NATO summit these days, according to The Washington Post. – The real focus of the event’s organizers has been ensuring the security of Romania’s important guests, and that has been realized on a massive scale, – the paper notes. 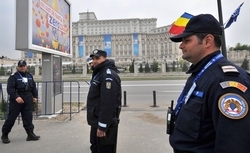 Gandul focuses on the 30,000 intelligence officers from everywhere in the world who arrived in Bucharest in order to ensure the security during the summit. “Eyes in the skies”, underground monitoring and ground checks take place everywhere. Curios old men are advised to stay away from their windows and balconies, for fear one of the snipers around may have a too eager finger on the trigger, the paper points out.